Many folks find bats fascinating until they start living in your attic and need professional removal! Bats play a crucial role in our ecosystem by gobbling up annoying insects. This includes the mosquitoes that seem to be everywhere during the summer months! However, like all wild animals, it’s much safer to observe bats from a distance—or at least from behind the glass window of a zoo exhibit. Bats may not be “chewers” like rats, mice, and squirrels, but that doesn’t mean that they can’t cause major problems. Frequent squeaking and scratching from a bat’s day-to-day living can be annoying or disturbing to humans, especially because bats are nocturnal. In addition to transporting fleas and ticks in their fur, foul-smelling bat urine and droppings can cause histoplasmosis in humans. Bats are also fairly notorious for their tendency to transmit rabies through their bites. Don’t let a bat’s tiny size fool you: these animals are bad news. If you have one in your home, it should be banished by a trained professional immediately! Piles of feces in your attic or your garage, or on any surfaces covered by some kind of overhang. Droppings from a healthy bat often resemble mouse feces (tiny, black, and spindle-shaped), but they frequently contain fragments of undigested insects and turn into dust when crushed. They also have a strong, distinct odor. Scratching or squeaking noises coming from inside your walls, attic, or roof. Discoloration (that is, yellowing or browning) on roof and wall surfaces. When they’re infiltrating your home, bats don’t need much in the way of an entry point. If they can find a hole just half an inch wide, they can let themselves in with absolutely no problem. Spotting such a tiny passageway can be difficult, especially if you’re a first-time bat “host.” Bats may fly in through open windows and doors, and they can also utilize vents and areas of damaged wood, brickwork, or shingling. Uncapped chimneys may let in bats, too. Not necessarily. First of all, bats are colony animals, which means that they like to live in large groups. Where there’s one bat, there’s usually several, and they’re not going to stop multiplying just because you cast out a member of their crew. It’s crucial, then, to verify that the bat in question acted completely on its own. More pressingly, though, bats are so tiny that their bites often go completely undetected—especially if the victim was bitten in their sleep. 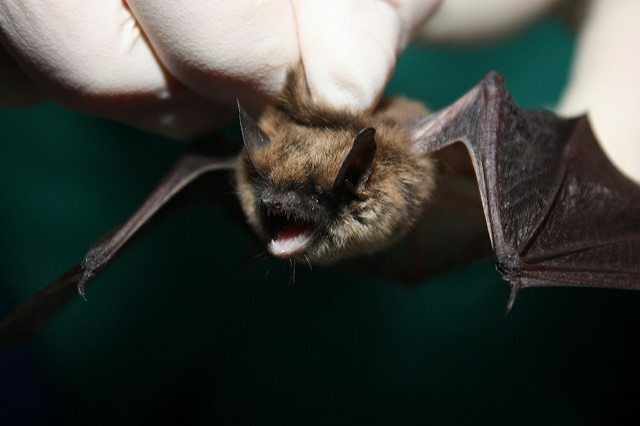 If there’s any chance at all that a person in your household received a bite (e.g., you found the bat in someone’s bedroom), they should seek medical treatment as soon as possible. Please don’t do this; it’s really not a good idea. Bats are wild animals, which means that only trained professionals should approach or handle them, lest you risk serious injury to yourself and the bats. Also, unrefined guano is full of harmful bacteria, meaning that it should only be collected with proper tools and safety equipment. The average homeowner is not equipped for this, so leave guano harvesting to people (and bats) who have established careers in the industry. Regularly inspect the exterior of your home, including the roof, and other outdoor structures for holes and cracks. If you find one, either plug it with steel wool or patch it with proper building materials. Clear your yard of dead trees, as bats love to use these for nesting purposes. Strongly consider removing sources of standing water on your property, such as bird baths or rain barrels. Like nearly all animals, bats are attracted to areas with easy access to water. Take measures to control the insect population around your home. Doing so will likely reduce the number of bats using the area as their hunting grounds. For bat removal in the Dallas, Fort Worth, and Houston areas, look no further than Chimney and Wildlife Specialists. We’re a BBB-accredited, award-winning company that utilizes humane, safe, and cutting-edge techniques to help homeowners get rid of bats. All of our specialists are certified, insured, and well-trained, so even the toughest jobs can be done quickly, efficiently, and affordably. We’re locally owned and operated, and in many cases, we offer same-day, emergency bat control, removal and trapping services. If badly behaved bats are causing you to lose sleep in DFW or Houston, then don’t delay—contact Chimney and Wildlife Specialists today!